You'll discover tucked-away gems like Puri Jagannath Temple and Anantagiri Hills. 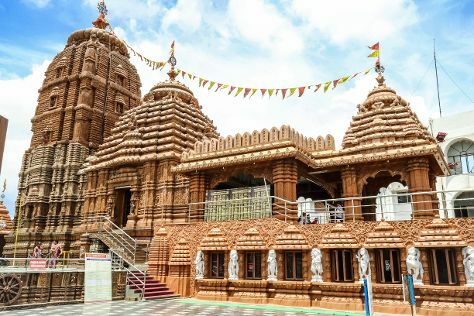 Get out of town with these interesting Hyderabad side-trips: Secunderabad (Subramanya Swamy Temple, Guruvayurappan Temple - Mceme - Secunderabad, & more), Nalgonda (Kunda Satyanarayana Kala Dhamam Surendrapuri, Yadagiri Gutta Temple, & more) and Sri Anantha Padmanabha Swamy devasthanam (in Vikarabad). Pack the 22nd (Tue) with family-friendly diversions at Ramoji Film City. Plan for a day of cool, family-friendly fun on the 13th (Wed) at Pride Resorts. And it doesn't end there: stop by Krishna Pearls & Jewellers, make a trip to Peddamma Temple, explore the historical opulence of Golkonda Fort, and contemplate in the serene atmosphere at Birla Mandir. To see where to stay, traveler tips, more things to do, and other tourist information, go to the Hyderabad itinerary site . If you are flying in from United States, the closest major airport is Rajiv Gandhi International Airport. May in Hyderabad sees daily highs of 103°F and lows of 80°F at night. Finish your sightseeing early on the 9th (Mon) to allow enough time to travel back home.